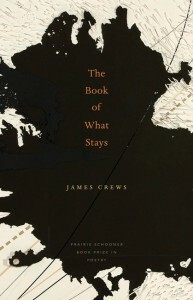 James Crews’ wonderful debut collection, The Book of What Stays, is a book that traffics comfortably in the world of sensory experience: in the image, in the sound, in the touch of skin on skin, and his predilection towards scene and narrative is a welcome advance—for this reader at least. When he begins the poem “Metacognition” with a statement like, “Neuroscientists insist it is the greatest gift / of being human, this ability to take a step back / and think about our own thinking,” we’re meant to know there’s a retort looming. And when the final line concedes favor towards the body’s finely tuned senses (“Sometimes I’m grateful the mouth just knows”), I can’t help but imagine intellectual/philosophic poets everywhere cringing. The moments of visceral conflict in particular are part of why I enjoyed Crews’ book so much: “Strange / clouds assembled that evening above I-80, alive and writhing, / what I thought to be the beginning of funnels,” the speaker tells us in the poem “With This Kiss,” creating a scene for us to inhabit and a sky chocked full of possibilities. And it’s no surprise that Crews, who also grew up in the Midwest, so often creates speakers who perk up at these dangerous skies with a kind of preternatural animal intuition. His advice is not disingenuous, even if it is impossible to follow—even for Crews. Informed by his life as a gay man growing up in the Midwest, Crews consistently goes deeper than mere personal anecdote on issues of identity, sexuality and place and often seamlessly interweaves ancient histories and myths—as if he’s mining for a lineage that works and striving to rescue a larger gay history from millennia of heterosexual gloss. Whether it’s Mary Magdalene staring down from the ceiling of an abandoned church, graffiti under the rotting bridge that reminds the speaker of cave paintings at Lascaux, Orpheus “tracing the chords / of a new boy’s spine,” Leonardo and his portrait of a young man posing as a saint, or Calamus mourning the loss of his lover Carpos, each history or myth conspires to become one voice, one story, one invariably tragic love. I could write another ten thousand words about the nuances and multitudinous layers of this book, but I’d be wasting time that could be better spent simply enjoying his poetry. Formally, Crews seems most at home and innovative in the long-lined couplets, paying great attention to sound, line breaks and pacing; but read his book for content, for what’s said and how it’s said, for the images (“And this sliver of lake you see now / will someday turn to a fast river you can follow to its source,” from “An Unexpected Warm Day in Wisconsin”), for the elegantly crafted lovers often delivered to us two lines at a time as if the form was drawing them forever together, for the desire to remember things as they happened or should have happened, however imperfectly either may be.